After we lost our 15 year old dog last October we realized that the house seemed very empty without her. This was a surprise because we had long ago decided that she would be our last dog. However, after about 6 months of life without a dog we realized we needed another one in our lives and began our search. We found Deeken's posting on Petfinder around the middle of May 2009. 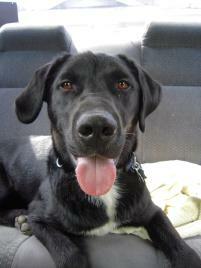 He was listed as a 9 month old Lab X who was very fearful due to his past. He had been found as a stray in Northern British Columbia with a big heavy chain around his neck (it had worn away all the fur and was much too tight as he was still growing). We had dealt with fearful behaviors in the past so that didn't bother us too much - we went by the shelter to meet him and put in an application - 3 days later he was ours. We've now had Deeken for five months and what a joy this boy has been. When we first brought him home we discovered he'd never been in a house and everything (mirrors, doorways, TV's, radios, etc.) scared him. Now, he is a confident, outgoing dog who loves everyone - especially his doggy friends. His favorite activities are trips to the dog beach where he can swim in the ocean and tear around in the sand, car rides, and going to doggy daycare. Very rarely do I see moments of fearfulness anymore but when I do all it takes is a quick word from me and he's checking out the new situation and settling down. Deeken has turned out to be one of those all time great dogs and I can't believe we ever considered not having one in our home.